Rethink your cup of tea. This loose leaf tea is organic and orthodox, meaning it is hand-picked and processed according to traditional practices. It is all sourced from small-scale, non-industrial tea farms before being combined with aromatics like dried flowers, vegetables, and herbs to make for uniquely flavored modern blends. Sprites Delight: A lush and lively green tea medley of strawberry and blueberry fruit, tangy elderberry flower, paired with a pinch of fragrant basil and earthy beetroot for a playful, exuberant cup that has pixies and elves alike frolicking with delight. Contains caffeine. 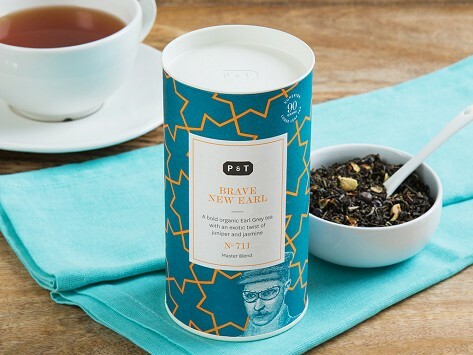 Brave New Earl: A case of genteel one-upmanship, this bold twist on the classic Earl Grey is inspired by the fancy for a refreshing, juniper-endowed gin and tonic under the Indian sun from where this black tea hails. Whiffs of jasmine accentuate its air of sophistication and exotic cool. Contains caffeine. Les Metrofolies: Indulge your sweet-toothed senses with this playful mélange of a smooth organic Chinese black regaled by rich cocoa nibs, zesty orange, and creamy vanilla. It’s delightful exhilaration in a cup, to be enjoyed with your favorite dessert or on its own. Contains caffeine. Berry Pomp: “Nothing succeeds like excess”, a certain favorite savant of taste and life once asserted. This super-charged fruity cup is filled to the brim with pure, exuberant black and red berry power delight. Caffeine-free. Cederberg Chai: This spicy-sweet, organic chai blends South African redbush with the local flavors of the Cape Malay people. Savory roasted red pepper, coconut, ginger, and tangy licorice come together to pack a lively punch—enough to race ostriches. Caffeine-free. Deep Asana: Pure organic spices of superior provenance are used to create this traditional, yogi-inspired Ayurvedic blend. The energizing yet grounding infusion helps to maintain a comfortable and steady state of body and mind. Caffeine-free. This is pretty good tea. It's a brisk tea and it hits the spot.